A brain injury has a devastating and life-long impact on the child and their whole family. Bones can mend and scars can heal but a brain injury stays with you for life and impacts on everything you think, feel and do. As the child develops, their support needs can change. Our ABI Coordinators are able to provide support during each stage of development, working with a child, their family, teachers, educational specialists, health and social workers, psychologists, and a wide range of professionals to help demystify acquired brain injury in children, and implement appropriate support strategies. Read on to learn more about our ABI service. For more information on acquired brain injury click here to view our jargon-free Factsheets. Referring to the Child Brain Injury Trust couldn’t be easier. The Trust’s priority is supporting children, young people and families and so we have a flexible, accessible referral process in all our projects. There is some essential information that we need before we can work with families to ensure accuracy of information and that children/young people are being treated fairly and are kept safe. For this purpose we will ask specific questions during the initial phone call or home visit. Referrals can be made directly by parents/guardians/carers that have legal responsibility for a child with an acquired brain injury, or anyone who has the permission of the parent/guardian/carer such as teachers, doctors, social workers etc. 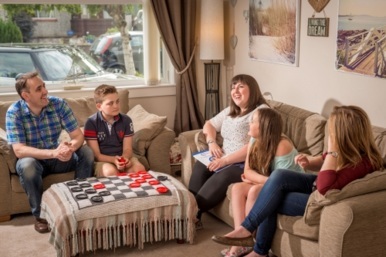 Children/young people with an acquired brain injury can also refer themselves, but we encourage them to speak to their parent/guardian/carer first as the injury impacts on the entire family, and support is more effective if the child/young person has a support network. There is no time limit on referring to the Child Brain Injury Trust. Generally the earlier the family has access to support the quicker appropriate systems of support can be put into place. We would therefore encourage a referral as soon as possible after the onset of the injury. PLEASE NOTE: We support children/young people and their families throughout their development into adulthood. You can therefore refer to us at any point up to a person’s 18th birthday. To support that transition into adulthood we will provide support up to their 25th birthday. After the age of 18 the injury generally falls into the adult services remit, and the challenges faced as a result of the brain injury are often very different. After the age of 18 we will work with our counterparts in adult services to ensure a multi-disciplinary approach to transition into adult services.